American inventor who was known internationally as “the Wizard of Menlo Park,” for the huge number of innovations coming from there, the world's first industrial research laboratory. [p.149] THIS illustration represents the first factory established in the world for the manufacture of incandescent electric lamps. The main building was originally occupied as the Edison Electric Pen and Duplicating Works, and for a time for the manufacture of a gummed paper. It was situated along the line of the Pennsylvania Railroad, at Menlo Park, N. J., a short distance from Mr. Edison’s house. In 1880, the glass blowing, carbonizing, testing, and other departments connected with the experimental work and early manufacture of the Edison incandescent electric lamp were removed from the laboratory to the electric pen works, which was equipped with several hundred of the modified form of Sprengel vacuum pumps, devised at that time at the laboratory, which were supplied with mercury by a huge steel pump on the Archimedes screw principle. The plant was equipped with its own plant for manufacturing gas for use of the glass blowers and for use in the carbonizing furnaces, and there was also installed a large engine and boiler plant for heating the buildings and driving the Edison dynamos, of which there were six in number, of the original “Z” type. These dynamos supplied electricity for lighting the buildings, for lamp testing, for flashing the lamps on the pumps, and for supplying current to a number of electric motors which were employed in driving the saw used in cutting up the bamboo, at that time used for the manufacture of the filament of the Edison lamp; also for rotating the annealers in the glass-blowing department, and driving the blower used for the carbonizing furnaces and for glass blowing; and an electric motor was also used for driving the Archimedes screw mercury pump. There were four motors in all, some series and some shunt. 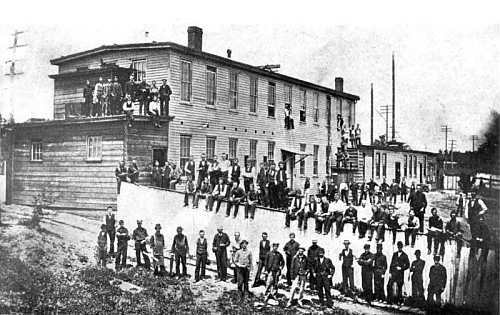 First Edison incandescent lamp factory at Menlo Park, N.J., 1880. [p.151] It is therefore interesting to note that this original plant of 1880 and 1881 employed a system of electric transmission of power in connection with its manufacturing operations, and it is also interesting to note that, prior to the installation of the engine and dynamos, the factory was run for a period of some months by power supplied by an overhead line from the Edison laboratory, three-quarters of a mile distant, 10 horsepower being transmitted for lighting and power purposes. Underground cables were employed between the power plant and the lamp factory and testing department. The engine and dynamo room and boiler house are not shown in the illustration. They run parallel to the main building and to the right. The testing department was well equipped with a photometer room, two electro-dynamometers, a Thompson reflecting galvanometer. Wheatstone bridge calorimeters and other apparatus. 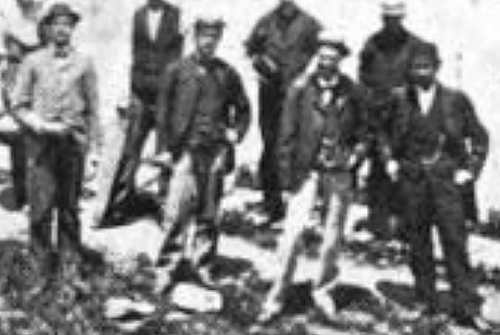 In the foreground of the picture are shown the original staff of the first Edison lamp factory. Reading from left to right the group consists of Mr. Philip S. Dyer. Secretary; Mr. William J. Hammer, Electrician; Mr. Francis R. Upton, General Manager, and Mr. James Bradley, Master Mechanic. In this, the first factory established for the manufacture of the incandescent electric lamp, were developed and put in practice many of the manufacturing methods which contributed so greatly to the success of the Edison incandescent lamp and its competitors throughout the world. The manufacture of the Edison incandescent electric lamp was removed to Harrison, N.J., late in 1881, where it has ever since remained. The building originally occupied at Menlo Park, shortly after its abandonment was set on fire by tramps, who made it their headquarters, and it was entirely destroyed. Science Quotes by Thomas Edison. 11 Feb - short biography, births, deaths and events on date of Edison's birth. The Talking Phonograph - Thomas Edison's invention of his tinfoil phonograph - article in Scientific American (22 Dec 1877) - with illustrated quote, medium 500px. 1 Oct - short biography, births, deaths and events on date of opening of Edison's Menlo Park lamp factory. Edison: A Biography, by Matthew Josephson. - book suggestion.